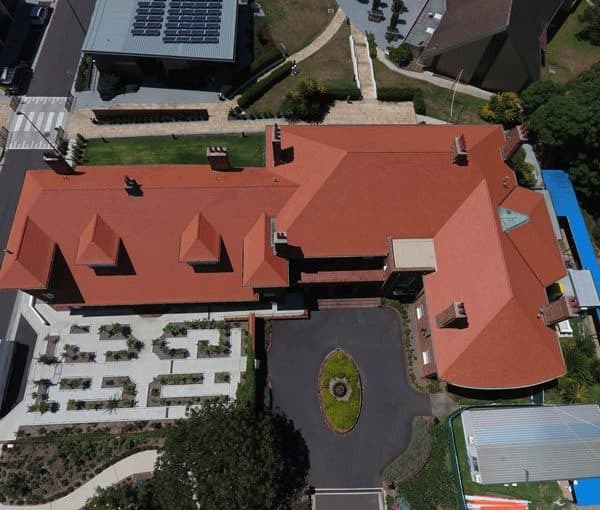 Slate Roofing Australia was contracted for the historic Lober House terracotta shingle tile repair project. In this project, our slate roofing experts replaced the existing terracotta roof with terracotta shingle tiles from Koramic. The Historic Lober House, in the Sydney suburb of Castle Hill, is a late Federation-style mansion and the grandest house of its period in the area. Built in 1926, it features several wings with complex hipped terracotta tile roofs and tall chimneys. Slate Roofing Australia replaced the existing roof with Belgium-made Koramic terracotta shingle tiles in 2015. Slate Roofing Australia has been recognised by the Master Roof Tilers and Slaters Association for its outstanding work on this project, earning the award of Finalist – Best Roof Residential Project. Lober House is an outstanding late Federation Arts and Crafts Style mansion, probably the grandest house of its period in the area with original interior features of note. Excellent quality design with distinctive terracotta tiled roof and tall chimneys. Built for Robert Craig Dixson in 1925-6 on a holding of 117 acres. In 1958 Elwatan and six cottages on the property were sold by the Dixson family to the Anglican Retirement Villages. They are now part of the Mowll Memorial Village.